This antibody reacts with alpha and beta subunits of human S-100 protein (21-24 kD). Melanoma tissues containing nerves, such as intestine and pancreas. Brain tissue. Our Abpromise guarantee covers the use of ab7852 in the following tested applications. IHC-FoFr 1/500 - 1/1000. 1/500 - 1/1000. Fix with 4% w/v paraformaldehyde and 15% saturated picric acid in 0.1 M. phosphate buffer pH 7.4.
ab7852 at a dilution of 1/1000, staining Astrocytes (purple; Alexa 488 secondary at 1/2000) on 30µm coronal brain section tissue in free floating IHC (see protocol link for detailed description). [A] Image taken with 20x objective and [B] Image taken with 40x objective. Images coloured in Photoshop. Publishing research using ab7852? Please let us know so that we can cite the reference in this datasheet. Thank you for your inquiry. I can confirm that antibody ab7852 should recognize the protein ab54050. But ab7852 (Anti-S100 antibody [B32.1] - Astrocyte Marker) is not tested and guaranteed for WB and it is not known if it binds to denatured S100 beta protein. Therefore I cannot recommend to use ab7852 with ab54050 in WB. If your customer is looking for a positive control for ab7852 (Anti-S100 antibody [B32.1] - Astrocyte Marker), I can recommend to use melanoma tissues containing nerves, such as intestine and pancreas, and brain tissue. Antibodies against S100 human protein that can be used in ELISA and WB can be found using the following link: https://www.abcam.com/index.html?pageconfig=searchresults&search=S100&pt=1&sk=targ&sv=S100&sn=S100&l=4&fViewMore=1 If I misunderstood the intentions of your customer, please do not hesitate to contact me again. I would like to buy a primary antibody product of yours, the ab7852 or the ab115968. Please let me know do the latter also react with either alpha or beta subunits of S-100 protein and what is the price of them with additional charges for shipping the products to Budapest, Hungary. Thank you for your inquiry. Yes, both ab7852 and ab115968 react with the alpha and beta subunits of S-100 protein. 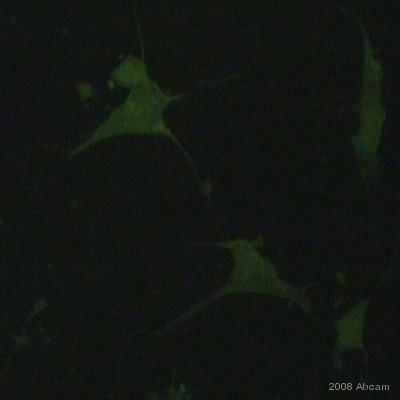 Anti-S100 antibody [B32.1] - Astrocyte Marker (ab7852) is €350.00 for 500ul. https://www.abcam.com/S100-antibody-B32-1-Astrocyte-Marker-ab7852.html Anti-S100 antibody [S100 217] (ab115968) is €360.00 for 1ml. https://www.abcam.com/S100-antibody-S100-217-ab115968.html Shipping & Handling is €63.00 to Hungary. You can order by: Phone: +44 (0)1223 696000 Email: orders@abcam.com Fax: +44 (0)1223 771600 I hope this information helps. Please contact us with any other questions. When this antibody was tested in IHC-frozen sections, how were the sections fixed? Thank you for your enquiry and patience. The originator of ab7852 has informed me that the sections were fixed with formalin. Please contact us again if you have any additional questions. Thank you for your very quick answer! I would have wanted to order a S100 beta specific antibody but the product ab7852 is an antibody against S100 protein. I want to use it as a specific marker of astrocytes or glial cells in the hippocampus and was wondering whether S100 protein could be detected in neurons as well. In other words could you certify that S100 protein detected by ab7852 antibody will label exclusively glial cells in the dentate gyrus of the hippocampus and not the neurons, evend immature neurons or neuronal precursor cells? Sorry for insisting and thank you again for your response. You list 1:50 for IHC in paraffin... is any antigen retrieval necessary? Do you suggest an enhanced secondary system such as ABC or a regular streptavidin reagent? Use enzymatic antigen retrieval using the protocol linked on the right hand side of the Abcam homepage. ABC is recommended as a visualisation technique.